Nothing like a simple, interactive campaign with small, set donations where you get something back to engage the masses. 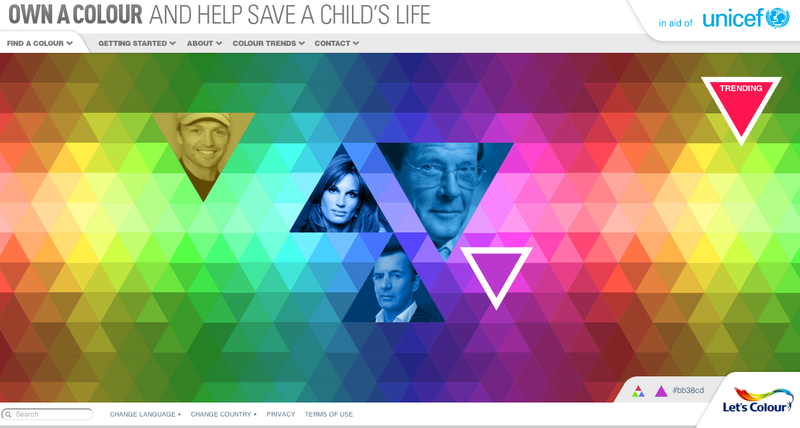 The new ‘Own a colour’ campaign by UNICEF and Dulux does just this. For one pound, you can purchase and name a colour. The money raised goes to UNICEF and they are aiming to name all 16.7 million colours. So far the money raised is just over £70,000. Although it is more about getting to name a colour after your dog than giving money to UNICEF, it is great to see an innovative partnership. The title ‘own a color’ sells the personal benefit, not the humanitarian one. But there is nothing wrong with this. People are tired of hearing ‘save a life’, so tapping into the I-get-something-back mentality makes it work. There is an underlying connection of missions – Dulux ‘add colour to peoples lives’ and this campaign allows you to add colour to a child’s life. Nice. Check it out over here.